On 13.05.1994 the Palestine National Authority (PNA, As-Sulta al-Wataniya al-Filastiniya) established itself on the liberated parts of Palestine (i.e. 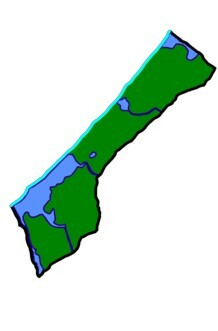 most of the Gaza-Strip and the town of Jericho). Gradually the Israeli occupation forces vacated 28% of the territories occupied in 1967: Zone A with 3% and Zone B with 25% of the occupied Westbank, as well as all (initially only some 60%) of the Gaza-Strip. More than 72% remain under total Israeli control. The Legislative Council consists of 88 members: 49 from Fatah, 15 independents aligned with Fatah, 4 members of Islamic groups, and 20 independents (as of 1996).